Haul out a lawn chair and fill a cooler full of ice; hallelujah, the three-day weekend is upon us, officially kicking off the summer. Lamb ribs are skinny guys, but there's alot of fat woven into the flesh making them very flavorful. For some, the long weekend begins with cleaning out the grill in preparation for a cookout. Burgers, chicken breasts, fish and beef steaks are the usual suspects for celebrations — common cuts suited for quick cooking that most Americans prefer and are accustomed to grilling. 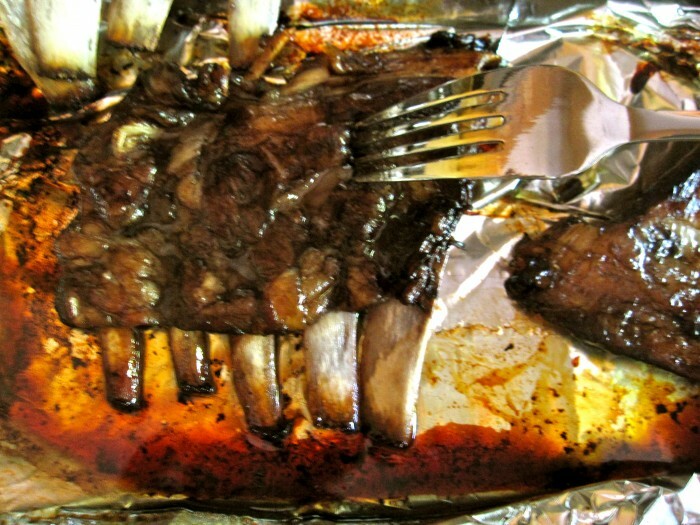 Beef and pork ribs are traditional red, white and blue barbecue favorites, as well. These cuts take more time and attention, but what better way to wile away the afternoon than by savoring the smell of sizzling meat over a fire and gnawing on a bone; an atavistic ritual our distant ancestors surely appreciated as well. This year I decided to shake up my traditional rib recipe by using lamb ribs, not to be confused with the meaty little chops or rack of lamb more commonly available at full-service meat counters. The ribs I’m using in this recipe are an extension of the rack, and generally overlooked. 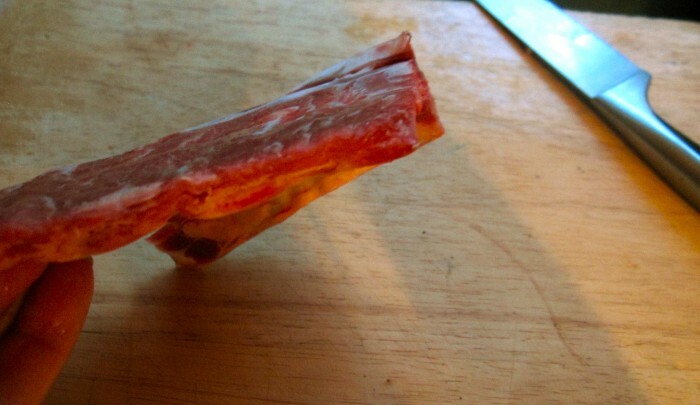 In fact, I’ve never noticed this cut of meat until recently at Sparrow Meats in Kerrytown. Marinate 24 hours, refrigerated, turning once. 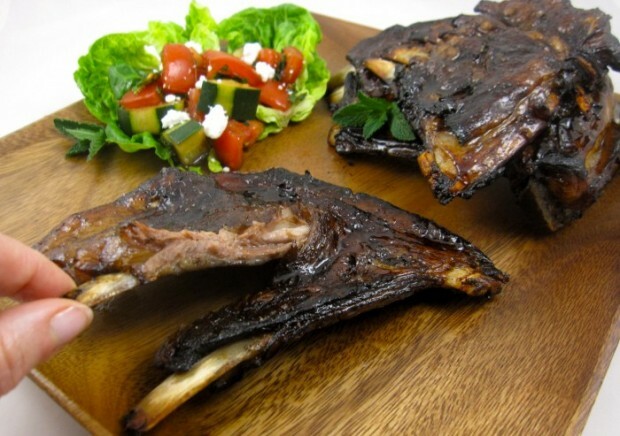 If you enjoy the flavor of lamb, you will salivate over the flavor of the meat from the ribs. The flesh is woven with juicy fat, which permeates the meat lending a rich, unctuous taste. On a flavor scale from 1 to 10, I give lamb ribs a 10. That said, this is not a recipe for fat-fearful folks. But if you’re a fan of pork belly recipes, and enjoy a good lamb chop, the following recipe is dedicated to you. The goodly amount of fat discouraged me from cooking over a flame, even an indirect one. Taking Bob Sparrow’s advice, I cooked the ribs slowly in the oven, then gave them a last minute char on the grill. Certainly you may grill the lamb over indirect heat in the spirit of the holiday, but keep a water spritzer close-by for flare-ups. Jennifer McClagan’s “Odd Bits: How to Cook the Rest of the Amimal” cookbook explores the possibilities for utilizing other forgotten pieces of meat on the animal. Culinary traditions outside of America are replete with recipes utilizing these economical “odd bits.” McLagan explains that as prime cuts have become more accessible, we’ve forgotten about the marvelous flavor of other economical cuts, these “odd bits.” Indeed, they may be impossible to come by for most urbanites. Ribs are done when flesh is easily pricked with a fork. But not if you live in Ann Arbor. One of the many virtues of living in a multi-cultural college town is the opportunity to experiment with a variety of food, not commonly found in supermarkets across America. I spoke with Casey, a Sparrow Meat market employee, who says they do a good business selling “odd bits” — such as tongue, brains, heart and kidney — to their Ann Arbor clientele. Customers also appreciate the the goat, quail, rabbit and pheasant Sparrow Meats also stocks. One of the blessings of this recipe is that the ribs may be made one to two days in advance. Before charring over the grill, simply bring the ribs to room temperature, heat your grill or oven to high heat, brush the ribs with the honey-balsamic mixture and char right before serving. Sweet honey and rich, tangy chocolate notes of balsamic vinegar — classic pre-grill marinade ingredients — are divine paired with lamb. The vinegar plays a starring role in this recipe, so it’s important that it’s worthy of the part. I used the reasonably priced, top-drawer Fustini 18-year aged balsamic. If you’re not a fan of lamb or are concerned about the fat, feel free to substitute pork or beef ribs in the following recipe. It’s all in the spirit of freedom; appropriate for a Memorial Day celebration. Whisk together 1/2 cup oil, 1/4 cup vinegar and 1 1/2 teaspoons of the garlic. 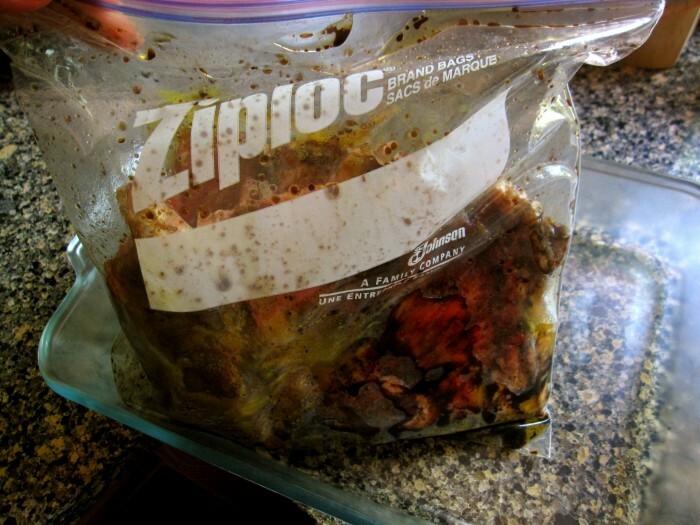 Place in a large pan or freezer-sized zip lock bag and arrange ribs in marinade. Place in refrigerator (if using a pan, cover), and marinade 24 hours, turning ribs once. Preheat oven to 250 degrees. Place ribs and marinade on a baking sheet large enough to accommodate them. Season ribs with kosher salt and freshly ground pepper. Cover pan in foil and bake on middle rack of oven 1 1/2 hours or until ribs are tender when pricked with a fork. (Larger pieces may take 2 hours). Make salad by whisking together the remaining 2 tablespoons olive oil, 2 teaspoons balsamic vinegar and 1/2 teaspoon garlic. Stir in tomatoes, cucumbers, mint and goat cheese. Season to taste with kosher salt and freshly ground pepper. If charring on the grill, prepare grill to medium-high heat. If charring in the oven, increase the temperature of your oven to 450 degrees. Whisk together remaining 2 teaspoons vinegar with honey, and brush over ribs. Char ribs on grill or in oven 5-10 minutes or until ribs are a rich, mahogany color.